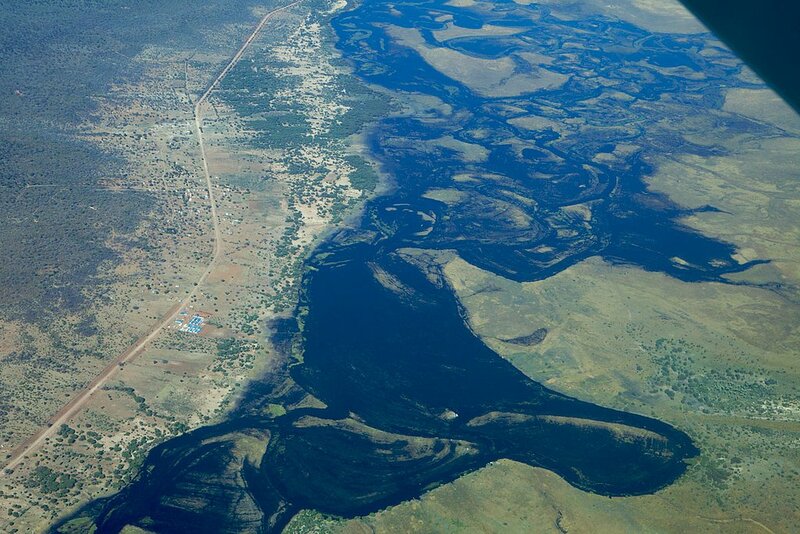 The delta is one of the most beautiful wetlands of the world. It is dificult to appreciate its vast size without seeing it from several thousand feet up. Another view as seen on from the air. 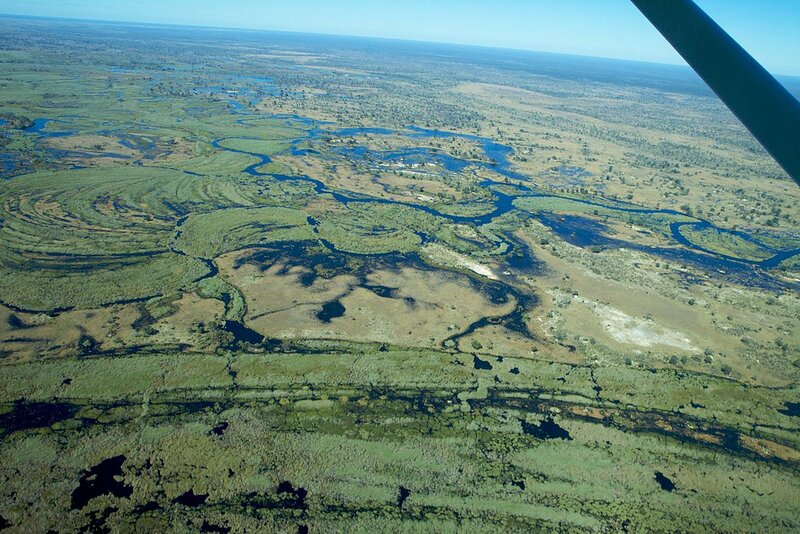 This photo was captured on route from Botswana to Caprivi Namibia. The falls are one of the "7 Natural Wonders of the World" and difficult to photograph without being a few thousand feet above!. 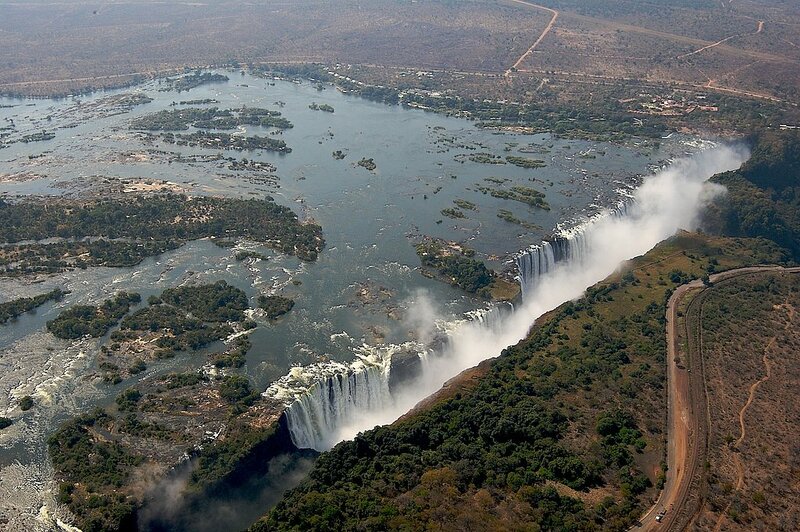 This is located in Zimbabwe. It is over a mile long! It is twice the height of Niagra Falls and twice as long as Horse Shoe Falls. 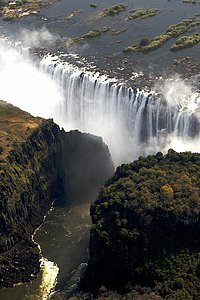 The water comes from the Zambezi River and falls into a large crevis in the earth which then flows quickly into a series of gorges which known to be extremely rough water. This picture is available for sale. Victoria Falls as it goes into the first gorge. This another view of the falls from a helicopter. Shown is the first large gorge that carries the water away from the falls. There are a few brave souls that try white water rafting in this gorge! There were no takers on this day. This picture is also availble for sale. 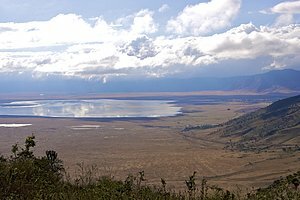 Ngorongoro Crater is located in Tanzania. It is labeled as the "8th Wonder Of The World" and is the worlds largest volcanic crater. It is 100 square miles and 2000 feet deep. 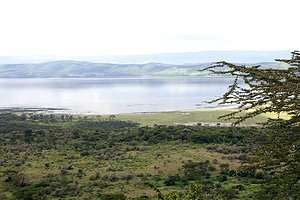 Lake Nakuru is located in Kenya. It is the location of the filming of "Out Of Africa." It is shown here at an elevation on the southern rim. It is seasonal home to thousands of flamingo and pelicans. 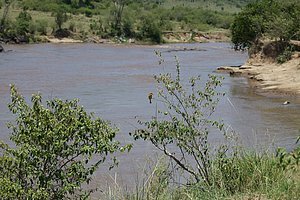 This is the famous Mara River in southern Kenya. 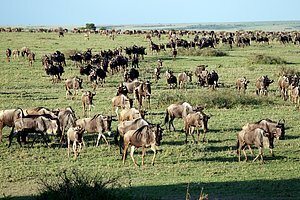 It is the site of the massive migration of wildebeest and zebra into the Serengeti of Tanzania immediately south of the river. It is difficult to see them but there are hundreds of crocodile in the river awaiting the migration. I waited for some time as the wildebeest were staging just few hundred yards away but they decided not today! These are the nearby wildebeests that are gathering to migrate into Tanzania from Kenya.